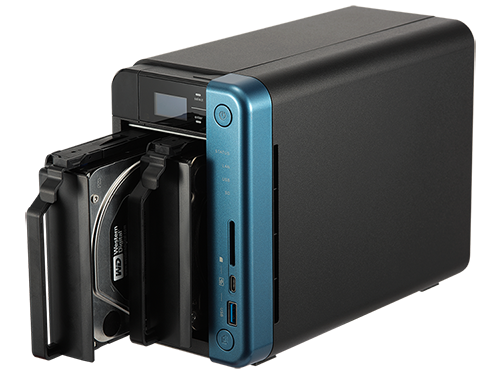 Anyone looking to enter the world of network-attached storage should give strong consideration to Qnap or Synology. 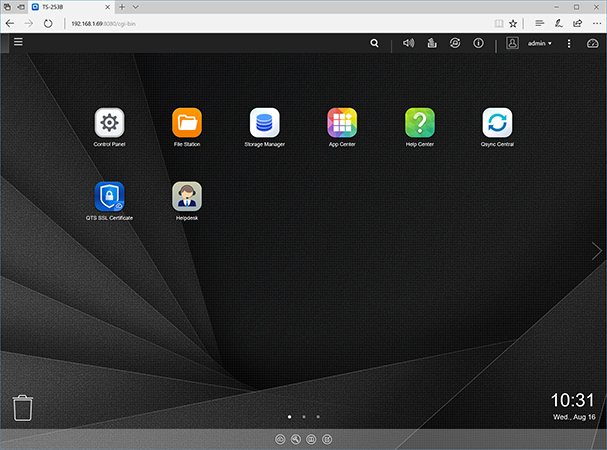 The two Taiwanese brands lead the way in terms of feature-packed software and robust hardware, and both are eager to refresh their product ranges on a regular basis with incremental upgrades that elevate the end-user experience. 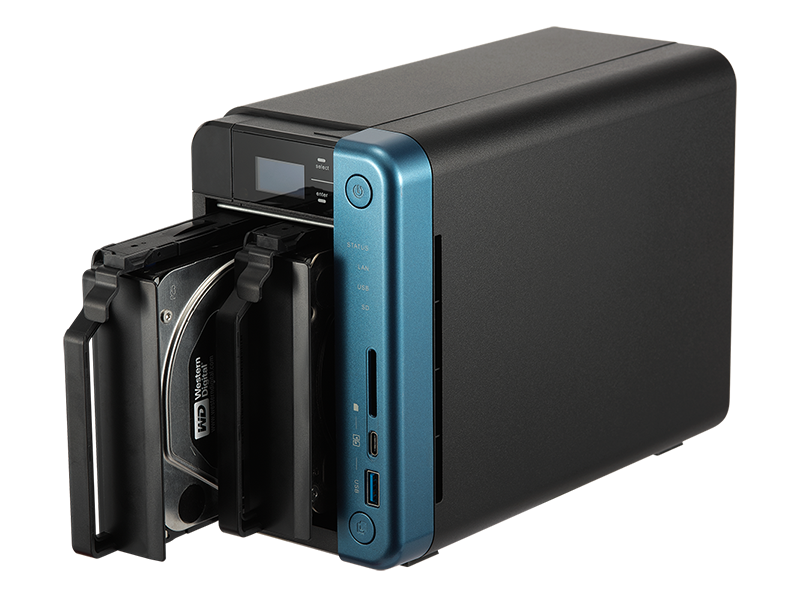 Qnap, in particular, is quick to roll-out new models, and the firm's 2017 portfolio has recently been expanded to include the new-look TS-x53B series. Available in two-, four-, or six-bay variants, priced from £515, £635 and £750, respectively, the trio is each offered with a choice of 4GB of 8GB of built-in memory and promise more features than you're ever likely to need. We've been sent the dual-bay, 8GB TS-253B-8G, priced at £600, for evaluation purposes. Qnap's lofty price tag is an immediate hurdle for a dual-bay solution, yet the TS-253B is a premium NAS for users seeking massive functionality irrespective of cost. The first thing you'll notice is the refreshed design, which includes a blue trim and a plastic front cover that slides away to reveal the drive trays. 3.5in hard disks can be installed without the need for tools, while 2.5in SSDs will need to be fastened, and there's a tidy OLED display beneath the plastic cover that shines through to display system information such as IP address, temperature and capacity. 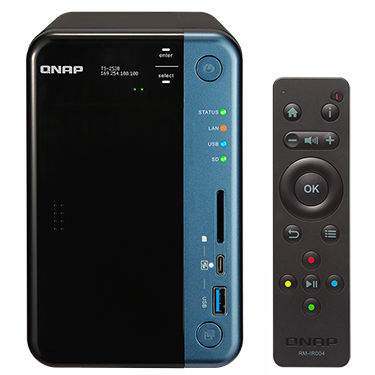 Build quality is decent, though the plastic front cover does feel a little flimsy, and Qnap continues to offer some of the best NAS connectivity options on the market. The front of the unit is home to an SD card slot, USB 3.0 with one-touch copy, and USB Type-C with QuickAccess. 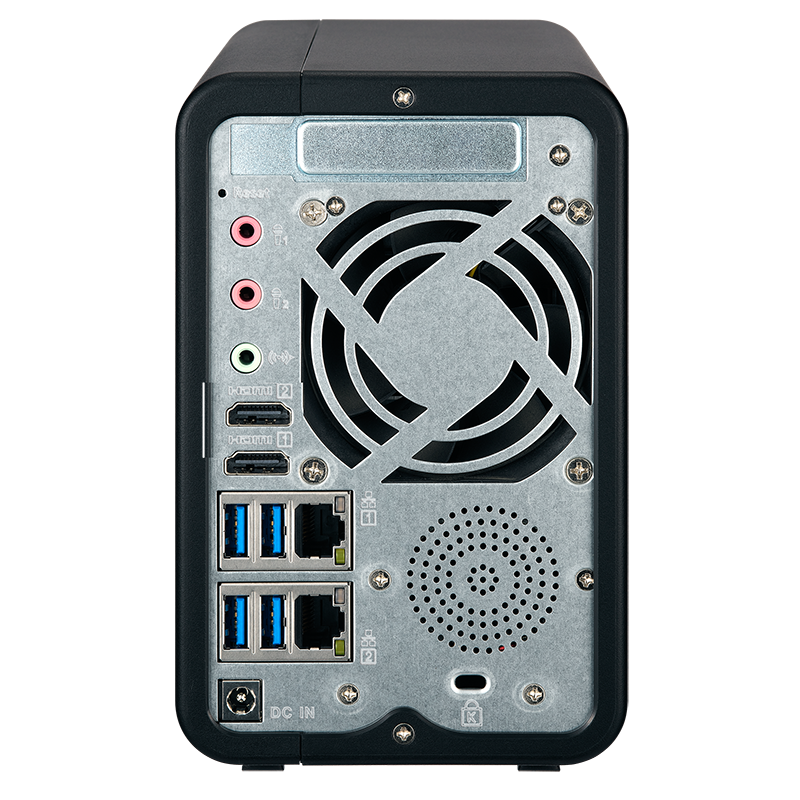 The latter allows for the NAS to function as DAS, and there's plenty more around back, where you'll find a further four USB 3.0 ports, two HDMI 1.4b outputs supporting 4K at up to 30Hz, dual Gigabit Ethernet with link aggregation and failover, a set of audio jacks and a connector for the external power supply. The built-in speaker has been upgraded to provide voice prompts as opposed to mere beeps, and on the inside Qnap chooses the tried-and-trusted combination of a quad-core Intel Celeron J3455 processor and either 4GB of 8GB of DDR3 memory. It's a shame some of the I/O options haven't been upgraded - we'd liked to have seen USB 3.1 and HDMI 2.0 as standard - but TS-253B does differentiate itself from most other dual-bay NAS solutions through the integration of a PCIe expansion slot. How much additionally functionality could you possibly want to add? 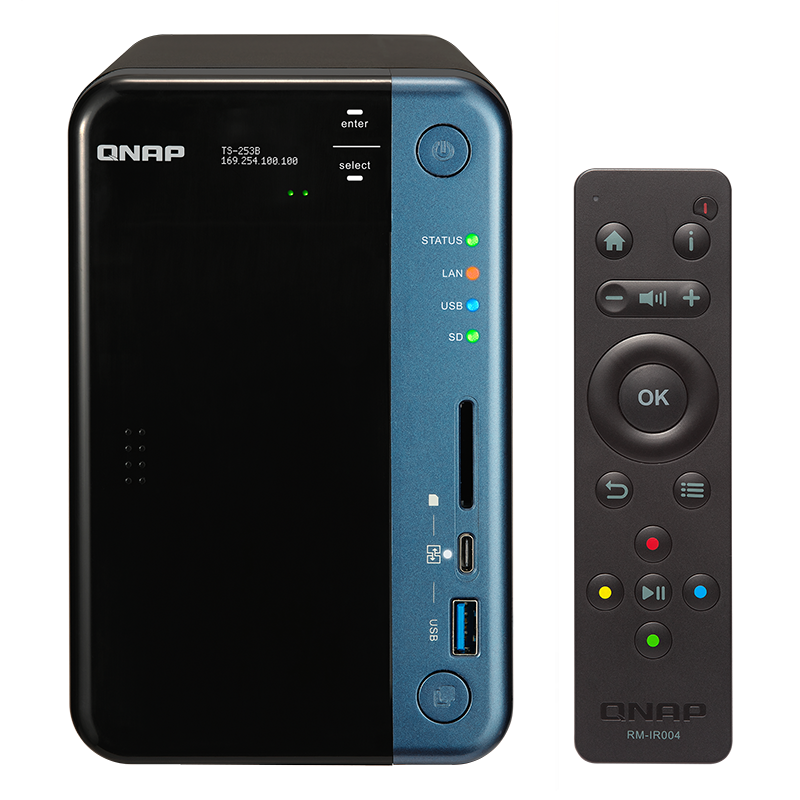 Well, Qnap has a range of accessories available, ranging from USB 3.1 expansion cards to wireless adapters, and the manufacturer was kind enough to send along the forward-looking £220 QM2-2S10G1T. Easy to install by removing the NAS side panel and slotting into the available PCIe slot, the QM2-2S10G1T expansion card adds dual M.2 SATA 6Gbps storage bays and a 10GbE network port. Appreciating that modern M.2 SSDs can get a little hot under the collar, Qnap includes thermal pads that attach to the drive and make contact with the fan-cooled heatsink. During testing with a couple of 256GB Kingston SSDs, we noticed that SSD temperature occasionally exceeded 60ºC, causing an automatic increase in fan speed and noise. 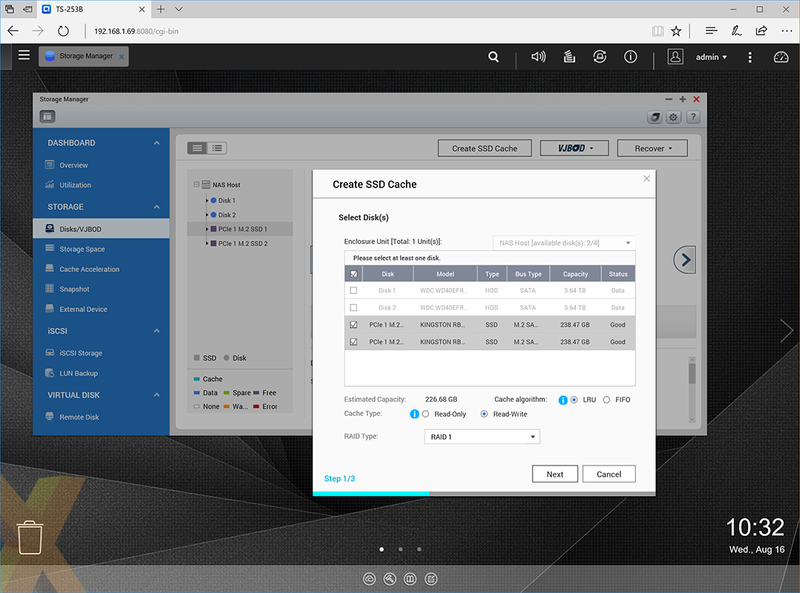 When up and running, the QTS operating system immediately notices the availability of a 10GbE network connection as well as the additional storage bays, both of which can be configured as a standard storage pool or as an SSD cache. In the latter mode, any available SSDs are used to accelerate hard disks by lowering latency and increasing IOPs performance, providing an injection of speed for those who are hitting the limits of traditional mechanical drives. Qnap's hardware is reflective of the price premium, and so too is the far-reaching QTS software. 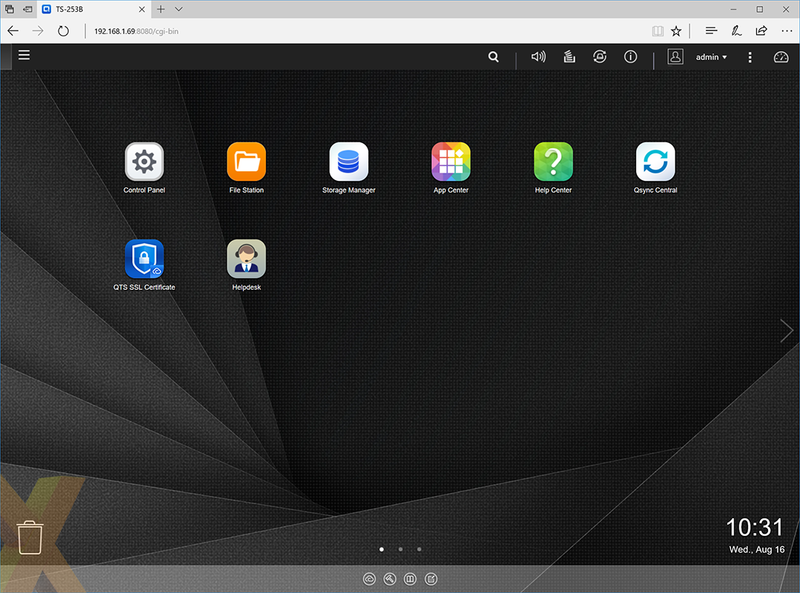 Easily one of the best NAS operating systems available today, the latest 4.3 release offers myriad of features presented in a tidy environment that favours multi-tasking and getting things done. The available functions range from everyday backups to full-blown virtualisation, and to test or write about every available feature would be an exercise in futility. We recommend visiting the official product page for a complete rundown of what the TS-253B can do, and it's well worth trying the QTS Live Demo while you're there, but we feel confident in stating that you'd do well to find a NAS as versatile as a Qnap. 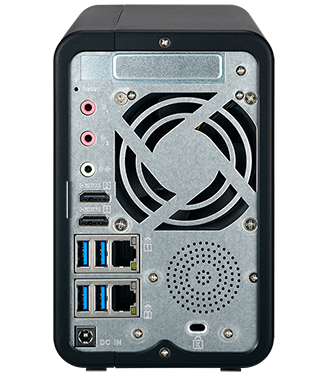 The TS-253B can be a backup destination for multiple devices, with cloud synchronisation for added peace of mind, it can function as a Plex media server with support for 4K transcoding and a bundled remote control, while advanced users can utilise the box as a VPN server while hosting a couple of virtual machines. Plenty of potential and though some of the features require a little networking knowledge, most users will find it easy to get to grips with the basics, making the TS-253B a potent solution for the home enthusiast or small business.